Join thousands who use the Matzie Assist Swing Trainer, and experience the thrill of better golf with longer, more accurate shots, and lower scores. The Matzie Assist, with its precision bent shaft, exaggerates the release with a force 16 times greater than a 6 iron to teach the correct hand action for longer straighter shots. Plus it eliminates slicing. The Matzie Assist is the world's best selling swing trainer with hundreds of thousands in use by PGA, Senior PGA, and LPGA touring pros, as well as golf schools, universities, and amateurs of all skill levels. Whether you're at home, in the office, or at the range, swinging the amazing Matzie Assist a few minutes each day makes golf easy and enjoyable. 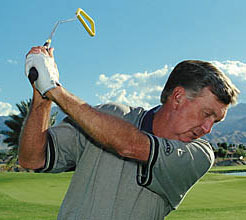 The Assist Training Aid comes with instructions written by a PGA Teaching Professional. If you have any questions regarding the Matzie Assist Swing Trainer, please give us a call, we would be happy to help you with any questions you may have. Write an online review on the Matzie Assist Swing Trainer, and share your thoughts with others.